HbA1c is a term commonly used in relation to diabetes. This guide explains what HbA1c is, how it differs from blood glucose levels and how it's used for diagnosing diabetes. How does HBA1c return an accurate average measurement of average blood glucose? When the body processes sugar, glucose in the bloodstream naturally attaches to haemoglobin. Because red blood cells in the human body survive for 8-12 weeks before renewal, measuring glycated haemoglobin (or HbA1c) can be used to reflect average blood glucose levels over that duration, providing a useful longer-term gauge of blood glucose control. If your blood sugar levels have been high in recent weeks, your HbA1c will also be greater. Note that this is a general target and people with diabetes should be given an individual target to aim towards by their health team. An individual HbA1c should take into account your ability to achieve the target based on your day to day life and whether you are at risk of having regular or severe hypos. What are the benefits of lowering HbA1c? How does HbA1c differ from a blood glucose level? HbA1c provides a longer-term trend, similar to an average, of how high your blood sugar levels have been over a period of time. An HbA1c reading can be taken from blood from a finger but is often taken from a blood sample that is taken from your arm. Blood glucose level is the concentration of glucose in your blood at a single point in time, i.e. the very moment of the test. This is measured using a fasting plasma glucose test, which can be carried out using blood taken from a finger or can be taken from a blood sample from the arm. However, fasting glucose tests provide an indication of your current glucose levels only, whereas the HbA1c test serves as an overall marker of what your average levels are over a period of 2-3 months. HbA1c can be expressed as a percentage (DCCT unit) or as a value in mmol/mol (IFCC unit). Since 2009, mmol/mol has been the default unit to use in the UK. Note that the HbA1c value, which is measured in mmol/mol, should not be confused with a blood glucose level which is measured in mmol/l. Use our HbA1c conversion tool to help with switching between the two measurement units. What result should I be aiming to get? The result may either be expressed as a percentage or in mmols per mol. The target for people with diabetes is to get an HbA1c value of under 6.5%. This is the same as being under 48 mmols per mol. Generally speaking, the lower HbA1c value, the better. Some people may be set less challenging targets by their doctor, particularly where hypoglycemia is a concern. A lot of people get confused about the units used to measure HbA1c. 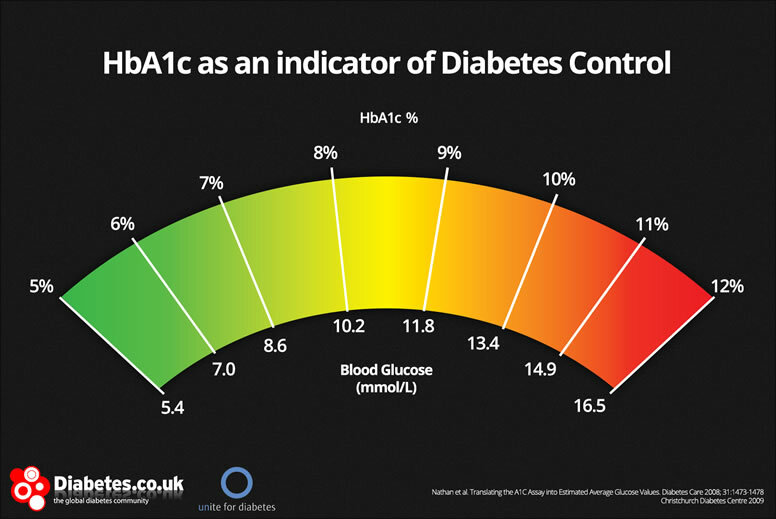 Diabetes.co.uk has an HbA1c units converter on its website which translates percentages into mmols per mol and vice versa. phone, desktop or as a printout. When should HbA1c levels be tested? Everyone with diabetes mellitus in the UK should be offered an HbA1c test at least once a year. Some people may have an HbA1c test more often. This may be more likely if you have recently had your medication changed or your health team are otherwise wishing to monitor your diabetes control more than once a year. Although HbA1c level alone does not predict diabetes complications, good control is known to lower the risk of complications. How do blood glucose levels compare with HbA1c readings? The table on the right (figure 2) shows how average blood sugar levels in mmol/L would be translated into HbA1c readings, and vice versa. It is important to note that because blood glucose levels fluctuate constantly, literally on a minute by minute basis, regular blood glucose testing is required to understand how your levels are changing through the day and learning how different meals affect your glucose levels.